Kuala Lumpur (VNA) – Vietnamese and Malaysian businesses shared experience in regional integration at a conference and a forum in Kuala Lumpur, Malaysia, on October 8. 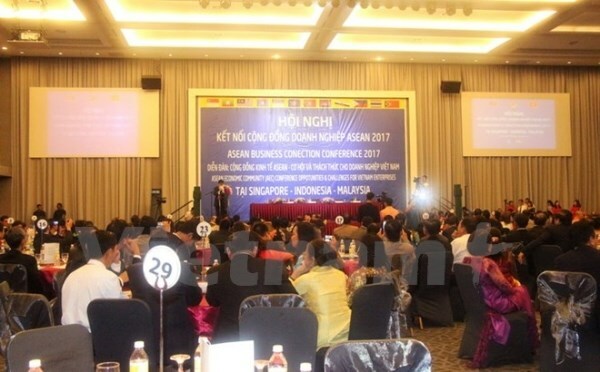 The conference on ASEAN business connectivity and the forum themed “ASEAN Economic Community: Opportunities and Challenges to Vietnamese businesses” were attended by more than 300 Vietnamese enterprises and a number of Malaysian counterparts. Speaking at the event, Dr. Doan Duy Khuong, Vice Chairman of the Vietnam Chamber of Commerce and Industry (VCCI), talked about changes in the business environment in ASEAN and the world at large. Such changes have generated both challenges and opportunities for the business circle, including those from Vietnam, he said, expressing his hope that Vietnamese firms would learn experience to overcome the obstacles and make the best use of the opportunities at the event. Vietnamese Ambassador to Malaysia Le Quy Quynh described the ASEAN member countries, including Malaysia, as promising markets for Vietnamese enterprises. The diplomat promised to do his utmost in order to support and connect Vietnamese and Malaysian enterprises together, contributing to enhancing the bilateral economic and trade ties. On this occasion, representatives from state management agencies, scholars and scientists cleared up questions raised by the participating firms, helping them gain an insight into economic integration.